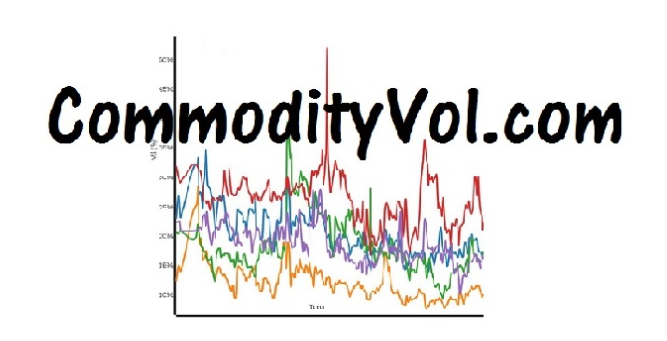 CommodityVol.com provides a lot of viewswith no strings attached. However, this data is typically delayed by more than 3 days old. Signed in users get the most up to date volatility estimates. CommodityVol.com has no interest in sellingyour data to mass marketers. We exist to inform and to sate academic interest in the subject. CommodityVol.com will review the info you provideand determine whether to extend you a login. Your application for a login does not guarantee our furnishing of one. Furthermore, we make no prognostication on the time between your application and our response. If you are rejected, expect no explanation. We reserve the right to be as capricious as we want. CommodityVol.com reserves the rightto deny service to any signed up or casual users. We reserve the right to terminate anyone's ability to view our analytics for any reason whatsoever. As a free service, we guarantee no one's right to view our output. Furthermore, abusive use of the system will result in measures that might affect more than the immediate users. We will use ip filtering, origin denial and all other technical means to curb abuse.